Here at James Hill, we try to raise all our animals (and our garden) as naturally as possible, avoiding most chemicals entirely and using others only when necessary. One of my favorite resources for this method of rearing goats is the book "Natural Goat Care" by Pat Coleby. As a nurse, I know that many health conditions can be avoided or improved by maintaining proper nutrition. This book contains excellent information on goat nutrition and husbandry. There has been some controversy over a few of her recommendations (specifically those regarding copper supplementation), but overall she provides an excellent blueprint for those of us who prefer a holistic approach to goat management. Pat's book is available on Amazon both in print and Kindle format. It's an interesting and informative read. One of my favorite, go-to goat resources! 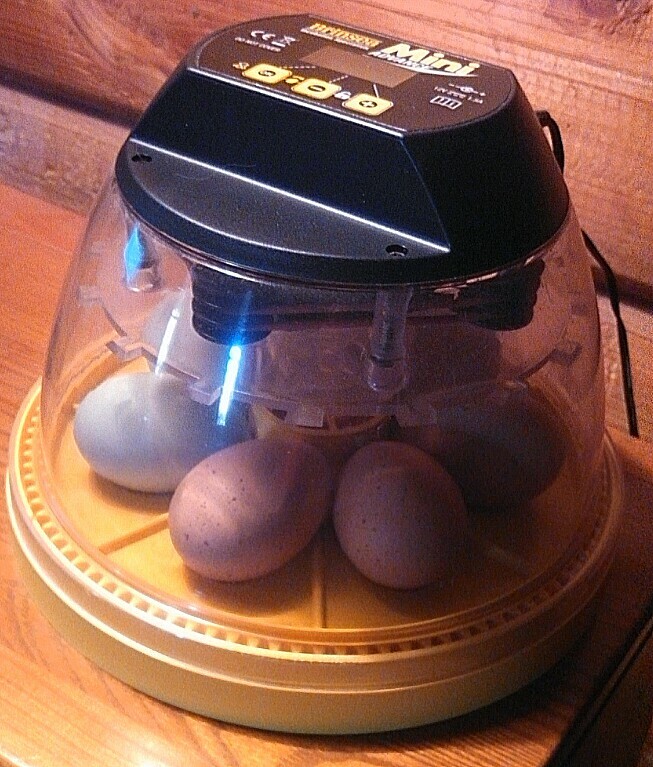 I really can't say enough about how pleased I am with this incubator. I am currently using it for my 5th hatch, and have no complaints so far in its function. It is small (7 egg capacity for chicken eggs), which is a perfect size for clutches of "specialty" eggs and backyard farmers like James Hill. Brinsea does offer very similar models that have larger capacity, but this one suits our needs very well. Made of thick yellow plastic base with a clear domed lid, it has all the features required for a successful hatch: fan, water reservoir, self-regulating heating element with temperature readout, and automatic turning rack. Operation of the unit is simple. Place your eggs in, pour distilled water into the reservoir, and replace the lid. Click through the menu buttons located on the top of the unit to select length of hatch, temperature, turning interval and angle, high/low temperature alarms and optional cooling feature. Settings are displayed on a digital readout right next to the menu buttons. Click to save settings, and your incubation is underway! The base, turning unit and lid clean up easily after hatch. My favorite feature is the visibilty provided by the clear lid. You can see each egg so you can watch for pips, then monitor your chicks while they hatch. If I had to improve anything about the design of this unit, it would be to include some mechanism through which to add water when neccessary. You do have to remove the lid to add water, and this particular model does not give a read-out of the humidity level.